Heliad II, built by the up-and-coming Dutch shipyard Lynx Yachts, is a prime example of a yacht that feels bigger than she is. 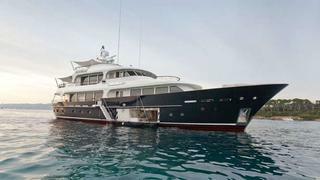 She looks like a 37 metre, she feels like a 40 metre, yet she measures only 33.4 metres. At first glance it’s hard to see how the yard has managed it. There are no obvious signs of overt space saving or corner cutting, and everything feels in proportion when you’re on board. The answer lies in her rather traditional-looking exterior, designed by Diana Yacht Design in Alkmaar, The Netherlands. The canoe stern allows full use of all her 33.4 metres, meaning that the aft main deck can extend all the way to the stern rather than being encumbered by a tender garage and swim platform. Not only does the canoe stern look traditional and aesthetically pleasing, it makes the main deck considerably bigger. Of course, the down side of this is that the designers had to find somewhere else to put the tender. They chose not, mercifully, to put it on one of the decks, but to build a tender garage amidships, between the crew quarters forward and the engine room. The large-volume displacement hull allows the guest quarters, comprising two twins and two doubles, to be moved further aft than normal. It’s an unusual arrangement, but an intelligent solution and makes very good use of what space there is. Built at the Scheepswerf Made facility in The Netherlands, the full-displacement steel-and-aluminium Heliad II looks, at first glance, like a very traditional motor yacht. But her timeless, traditional exterior hides a bright, modern interior that is quite surprising. When I step aboard I am expecting to see sober colours and traditional ‘gentleman’s club’ style furniture, or maybe a modern take on an Art Deco interior, rather than her bright colours and minimalist chic. Being a yacht primarily for the charter market, the owner wisely avoided the temptation to put too personal a stamp on his yacht, so the interior, designed by Weber Yacht Design, stops short of being too bold, too personal. 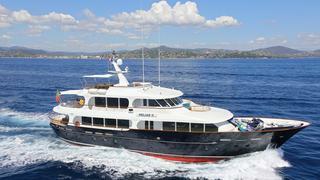 But it’s far from the bland style so often adopted for charter yachts. The flooring is bamboo, the rest of the woodwork is light oak, and the style is sleek and contemporary, with splashes of colour to offset the subtle earth tones used throughout. 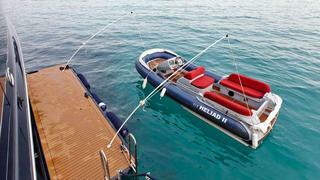 The layout of Heliad II is pretty standard – albeit standard for a boat five metres longer. 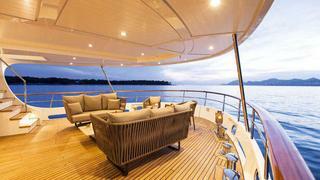 On the main deck you have a large aft deck with sofas and a couple of armchairs. A pasarelle at the stern allows boarding when moored stern-to, but otherwise access is via the fold-down door of the tender garage on the starboard side, which also acts as a swim platform and beach club. 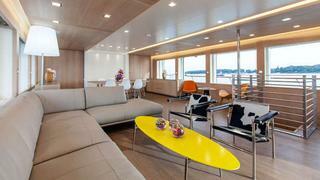 The main saloon features a seating area on the port side around an unusual, surfboard-shaped bright yellow coffee table, while opposite are stairs down to the accommodation deck. Further forward is a simple but formal dining area that continues the modern look, with space to seat eight around a custom-made dining table topped in bamboo to match the floors. The galley, to port forward of the dining area, is a good size and well equipped, with access to the port side decks and down to the crew quarters. Here we find the only glitch in a well thought-out layout: the access to the crew quarters is directly behind the galley door. The crew quarters consist of a crew mess, a captain’s double cabin, and two twin crew cabins. At the forward end of the main deck is the owner’s suite, a sumptuous bedroom bathed in natural light from the large windows on either side. A good-size en suite and a dressing room occupy the space forward of the owner’s cabin. Down on the accommodation deck there are two identical twin cabins, each with a Pullman berth, and two identical doubles. These aren’t enormous, but they’re perfectly serviceable and you have to remember this is only a 33-metre yacht. From the main deck, just forward of the dining area, a flight of stairs leads up to where an excellent wheelhouse offers good all-round visibility. Aft is the upper saloon, a large space that features a long sofa on the starboard side and a bar that sits between the upper saloon and the upper deck. Big sliding doors allow the upper saloon to be closed off during cold or inclement weather, or opened up to create a wonderful indoor/outdoor space in conjunction with the sundeck. The flooring throughout is teak, which means there is a natural flow between the two spaces, and it is also a practical consideration. 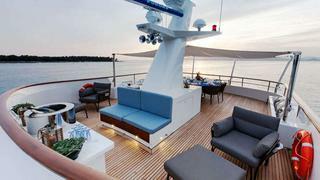 The upper deck has enough room for several sunloungers as well as benefitting from a huge sunpad aft. From a chartering perspective, this whole deck works very well indeed, giving guests plenty of space in the sun or the shade, and served by a centrally located bar. 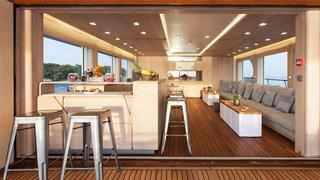 Forward of the wheelhouse on this deck is another outdoor area with a small table and chairs. Up another level brings you to the sun deck, which has a large dining table and chairs, shaded by a retractable awning, lounging space for guests, and a serving area for crew. The 360-degree views make it a delightful spot for long lunches or for enjoying the view while underway. The thing that strikes you most as you walk around Heliad II is how much bigger she feels than her dimensions would suggest. 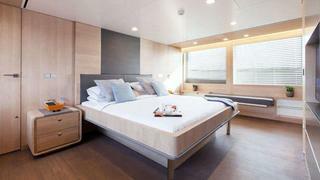 The designers have managed to fit in three double cabins and two twins into a 33-metre boat, without it feeling at all cramped. Yes, the saloon could be a little bigger and if you had a full complement of guests on board seating everyone in the saloon might be a squeeze, but the cabins are large enough to feel that space-saving hasn’t been uppermost in the designer’s mind. This is very much a boat designed with al fresco living in mind. The outside spaces are fantastic, with four distinct exterior areas (plus the beach club) available for dining, relaxing, sunbathing and swimming. From a charter point of view, this makes perfect sense. There is enough room for all the guests to socialise together if desired, but also enough places for guests to have their own space and solitude if that’s what they want. From a crew space design point of view, Heliad II works well too. The workspaces are large enough not to feel too cramped, and the flow of the crew areas means that they have access to the parts of the yacht they need to without having to disturb guests unduly. Heliad II was the first yacht launched by Lynx (they have subsequently launched a 24-metre superyacht support vessel, YXT One, the first yacht in its Yacht-X-Tender series) and she shows excellent attention to detail, some very neat design touches, and a willingness to think differently about the style and design of their yachts. Most 34 metre yachts end up being very similar to each other because there is a limited amount of space on board, and most designers come up with the same solutions to the same problems. Heliad II manages to be different without being overtly quirky. The designers have maximised the available outside spaces, while retaining a spacious feel inside. That’s a pretty impressive achievement, and it looks likely she will prove to be very popular on the charter market. 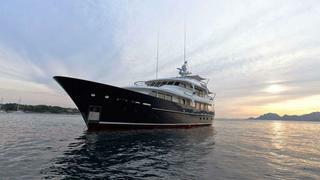 She certainly deserves to be, because this is a delightful and interesting yacht.